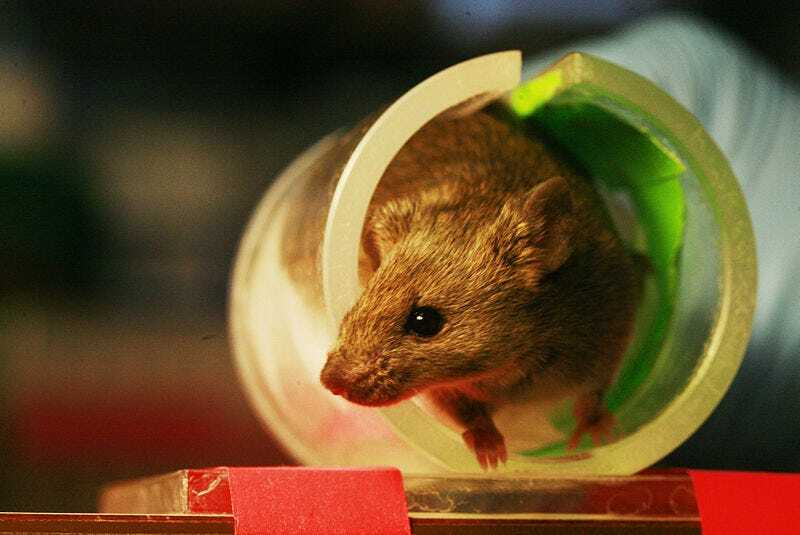 The wheel-running rodent is frequently associated with animals inside psychology laboratories. But what would happen if you gave wild animals access to a wheel? A pair of researchers found out. While exercise has always been thought of as important to help prevent maladies like cancer, diabetes, heart disease, sleep disorders, and to promote mental health, wheel running hasn't always been thought of in such positive terms. Indeed, despite the fact that such exercise promotes neurogenesis in aging rats, wheel running has sometimes been thought of as unnatural, as a stereotypical or "repetitive" behavior that's only seen as the result of captivity. But that assumption has never been subject to the scientific rigor of experimentation. It could be, after all, that animals like rodents simply enjoy running. While there has never been a formal exploration of wheel running behavior in wild rodents, the closest might be a bit of private correspondence between "Father of Ethology" Konrad Lorenz and a mouse researcher named J. Lee Kavanau. Lorenz told Kavanau that rodents that had escaped or been released from captivity were seen entering and running on wheels that were accessible to them. Still, those were critters that had ostensibly already had experience with wheels. To really see whether wheel running reflects natural behavior or not, a truly wild population would be required. Researchers Johanna H. Meijer and Yuri Robbers from Leiden University in The Netherlands placed running wheels in two wild locations where they knew feral mice to be abundant. One was a "spacious, green urban area" and the second was a "dune area not accessible to the public." At each location, a wheel outfitted with automatic motion detection was placed alongside an infrared motion sensor and a camera with night vision. Whenever the wheel or sensor detected motion, it triggered the camera. In addition, there was a food tray to attract the animals. The entire assembly fit inside a cage, with a permanent opening large enough for a rat to easily enter and exit. Over the two years in which the duo collected data, Meijer and Robbers wound up with more than 1200 observations of wildlife taking advantage of the temporary exercise equipment. The majority of observations were of mice, but shrews, rats, snails, slugs and frogs also got workouts from the running wheels. Meijer and Robbers write, "Some animals [like snails and slugs] seem to use the wheel unintentionally, but mice and some shrews, rats and frogs were seen to leave the wheel and then enter it again within minutes in order to continue wheel running. This observation indicates that wheel running may well be intentional rather than unintentional for these animals." You might wonder whether the animals had somehow made a mental association between the food and the running. The researchers wondered the same thing, and partway through their data collection process they removed the bait from the wheel in the urban area. While visits to the running wheel decreased after the food was removed, it didn't cease entirely. In fact, when the food was missing, the proportion of overall visits that included running (rather than a simple inspection) actually increased! That indicates that while the food may have attracted animals to the apparatus, it wasn't the food itself that triggered the wheel running behavior. While there is disagreement over the origin of stereotypical behaviors and whether they truly reflect bad welfare, the definition of stereotypies is generally agreed upon by researchers. Stereotypical behaviors are "repetitive, invariant, and devoid of obvious goal or function." On its surface, wheel running would appear to fit that definition. However, researchers also generally agree that stereotypies are themselves limited to captive environments. Since wild animals eagerly use running wheels, that sort of running is a voluntary, rather than compulsive, behavior. That wheel running continued even in the absence of a tasty snack "implies that wheel running can be experienced as rewarding even without an associated food reward, suggesting the importance of motivational systems unrelated to foraging," say Meijer and Robbers. "Our study indicates that running in wheels can be a voluntary behaviour for feral animals in nature," they add, rather than evidence of stress or a psychiatric disorder. The experiment doesn't only establish the validity of wheel running in rodents as a model for better understanding human health. It also underscores the fundamental cross-species importance of exercise. Lack of exercise has been implicated by the World Health Organization as one of the leading factors causing the so-called "lifestyle diseases," like cancer, diabetes, heart disease, depression, obesity, and more. Perhaps we ought to take a cue from the woodland creatures that took advantage of the free treadmill and get ourselves to the gym a bit more often.